We believe big changes happen one person at a time, and so TCE Fund provides resources for the door-to-door canvassing work in partnership with our sister organization, Texas Campaign for the Environment. Canvassing enables us to reach diverse communities across many socio-economic backgrounds. Our supporters share a common concern for the environment and a respect for the individual who comes to their doorstep with an important public health issue. Our program staff make presentations about zero waste, recycling, composting and producer responsibility programs in schools, neighborhood associations and other civic clubs. We write educational resources such as information about recycling household hazardous waste and electronics. We let the public know how companies can be more sustainable through our corporate campaigns. We are the only grassroots environmental organization that has full-time offices and staff in DFW, Greater Houston and Austin, and the only group that regularly sends community organizers out into towns beyond the major cities in Texas. Texas Campaign for the Environment Fund canvassers knock on doors from Amarillo to El Paso, Brownsville to Texarkana, and everywhere in between. The basis of our educational programs is research. We produce research reports and fact sheets to inform the public, elected officials and corporate leaders about a wide variety of environmental issues. 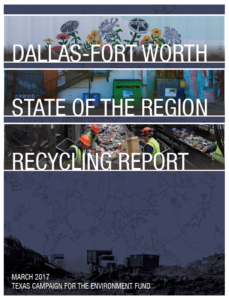 Our most recent report covers the state of recycling in North Texas communities, providing case studies and public policy recommendations for dramatic waste reduction and universal recycling. In 2015, we published a report on the environmental costs of single-use batteries and options for manufacturer-based recycling programs. We have published a series of reports on electronics takeback recycling programs in Texas. We never endorse candidates, but we do register Texans to vote and let our supporters know about upcoming elections. We want people to know who their elected officials are and how to hold them accountable to concerns that affect our lives and families. After all, an active, engaged democratic process is the best defense against pollution. Are you registered to vote? You can check on your voter registration here. Do you know who your elected officials are? Find out “Who Represents Me” here.